Good Day, Regular People: What Is The Serenity Suite At BlogHer? Since 2006, BlogHer has been creating a place for conference attendees to find some quiet when they seek it; a comfortable room they can go to -- to help calm social anxiety nerves, take a breather, or just ::center:: (I can't be the only that needs to sit and press two fingers to my temples, alone). This year is no different. That place is The Serenity Suite at BlogHer. Last year, a team of dedicated and caring bloggers led by Maggie and Heather, made sure someone was always there to greet you as you walked through the door -- and they are back! What the Serenity Suite is is an alcohol free zone, which makes it the perfectly convenient place to take a break away from booze and not have to be alone somewhere if you don't want to be. This year will be very special. Serenity Suite will be honoring our beloved Susan Neibur, of whymommy, whom we lost much too early, this past February. We'll have note cards in the suite, where we want you to tell us your memories of Susan, or of anyone in your life that has battled or is now battling cancer. Write their names down, talk to us about them, let's have everyone who comes into the Serenity Suite know about them. I am honored and excited to be one of the crew volunteering my time with The Serenity Suite this year. I'm so happy that The Suniverse will be there with me, on Thursday night, 7 - 9 p.m. So if you find yourself in need of some personal space and wishing for a place to go, stop by and talk to us, or come and sit quietly. Take a nap if you'd like, sit and stare into space if that's what recharges your batteries. Whatever you need, we'll be your haven for as long as you need us to be. Any way you're there, we'll take you. And we'll be so very pleased to meet you. 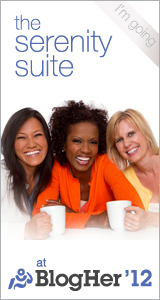 If you are looking for an onsite recovery meeting the suite is the place for you! Visit the suite and times will be posted. Heather is updating her site often with new and exciting details - check it out! P.S. For those of you in recovery (of any kind), we will have local recovery meeting times and locations available on site. A place like that would be nice any day. I'm always stuck using my bathtub! Anyway - I look forward to seeing you there! Oh that is such a great idea. And very cool of you to volunteer your Blogher time there. I hope you meet a ton of amazing people. I think you have helped me finally figure out what use I can make of our spare bedroom...perfect name included! Now if you would just check on me once and awhile! You are so lovely, Alexandra. Can't wait to see you next week! I didn't realize it's an alcohol free zone which is great for people in recovery. I can almost predict who WON'T be in alcohol-free zones! This sounds so wonderful! Thank you - I am sure I will be passing by for a time out. And you are definitely one woman I want to meet. The Serenity (Now) Suite was a huge source of relief during my first BlogHer two years ago. We (and when I say "we," I mean "I") socially awkward types really need the destressification it provides. Yeah, that's a word; I don't care what Words With Friends has to say about the matter. We are so honored to have you on the team this year, lady. THANK YOU.